In central conveying system, central vacuum generator will provide vacuum (negative pressure) power. This machine adopts high pressure blower or Roots blower as its core power, which has features like heavy-duty, great power and long service life etc to ensure continuously loading. 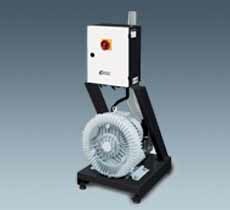 Besides, this series offer more than 11 models with maximum 15 HP applicable to different system applications. The start of the blower is controlled via central control station and can work with equipments like Euro vacuum central hopper and central filter to realize automatic material loading function.